How do outdoor furnishings dictate the design of your Columbus screened porch? Archadeck of Columbus explores the importance of outdoor furnishings in a screened porch design as part one of a two part series on decorating and interior design of outdoor structures. The area you envision may be quite different than the reality of that space without the guidance of an outdoor living expert. This Zen inspired screen porch in Upper Arlington, OH is a great example of good space allocation in regards to furnishings and spatial harmony. When you think of your ideal outdoor space, what do you envision? Certainly an empty space doesn’t come to mind. Outdoor furnishings make your outdoor room a living breathing space full of function and beauty just like the contents of our interior rooms are the things that truly make our house a home. The most important thing when designing a screen porch is determine exactly how you will use the room. With our interior rooms, we don’t have this flexibility. Our only option is to work with the space and layout that “comes with the house”. But your new screen porch can and should be designed completely to suit how you want to live.For example, are you planning on using your porch for dining, seating or both? This Powell, OH Screened porch uses the classic lines of wicker furnishings and dramatic interior reveals to make a bold design statement. When we work with homeowners, once the homeowner determines the main use of their screened porch, we then discuss the furnishings that they wish to include. And we discuss this in detail. You’ll see why this is so important. For example, deciding what shape and size you anticipate your outdoor dining table to be will determine the amount of space you need down to the square footage. Ample space for furniture pull-out room and creating enough space for good path and traffic flow is crucial to the enjoyment you will get out of using your space. Too much furniture, or furniture that is too big for your outdoor space will crowd the space and make it less livable and enjoyable. This is the reason that many times I walk the homeowners into their interior living rooms where we take measurements. This gives them an example of how much room they need for seating and eating. Notice how this Columbus, OH screened porch leaves plenty of room for pull out room to comfortably use the dining table, as well as traffic flow. Utilizing experience and some math, we can determine the minimal square footage you will need to accomplish your outdoor living goals. Here’s an example. As a general rule of thumb a standard outdoor dining table encompasses an area 6 feet long and 42 inches wide. Each chair will add an additional two feet to this. Ample pull out room for each chair will add another two feet per chair. This adds up to a space that takes up a 12′ x 12′ area. In addition to dining tables, most homeowners want a place for seating as well, which will take up additional space. Once you add side tables and accompaniment pieces, you are looking at more space than most homeowners had anticipated for their furnishings. 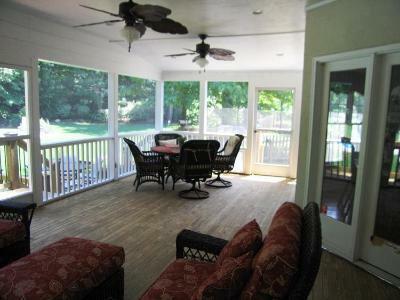 This Screen porch with Chippendale panel details features an open airy design with plenty of room for entertaining. One of our goals as an outdoor living structure expert is to provide you with an outdoor space that will fit your furniture as well as your lifestyle. 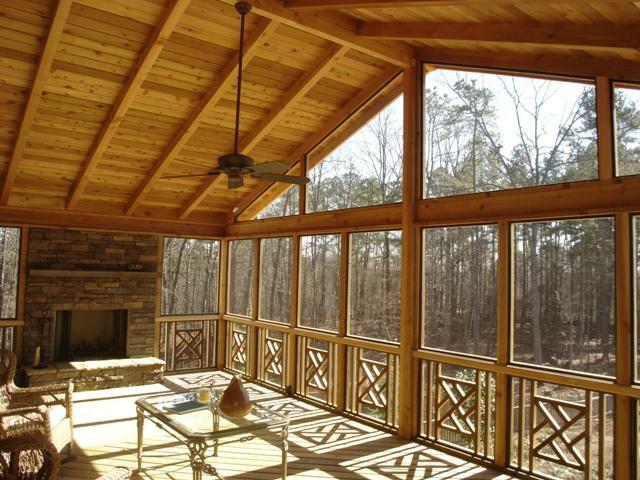 The furnishings you choose aren’t the only factor that dictates the size of your screened porch. How it attaches to your home and proper placement is also a crucial factor of how large your area can be. Having your furnishing ideas in mind before you meet with your contractor is very important. You don’t have to purchase prior to our consultation, but it’s great to have some specific ideas about how you want to use the room and what furniture you will add. For example, if you are thinking of adding a table that seats 4 but want 6 chairs, that will add a couple feet of needed space to accommodate the use of those chairs. See more examples of well-designed screen porches that offer plenty of function and beauty by visiting our screen porch and outdoor living photo galleries located on our website. Author archadeckofcolumbusPosted on August 29, 2012 Categories Interior design of outdoor structures, Interior design screen porch, Screen Porches, The Design SeriesTags Addressing the spatial needs for your Columbus OH screen porch, Archadeck of Columbus, Arlington OH screened porches, Columbus OH decorating and outdoor design of outdoor areas, Columbus OH screen porch builder, Columbus OH screen porch outdoor furnishings, Columbus OH screen porches, Columbus porch builder, Contemporary screen porch designs in Arlington Ohio, Designing the Columbus OH screen porch that works best for you, Getting the most out of your Columbus OH screened porch, How furnishings dictate the design of your Columbus OH screen porch, outdoor living, Powell OH Screen porches, Screen Porches Columbus Ohio, The importance of the Columbus OH design renderingLeave a comment on How do outdoor furnishings dictate the design of your Columbus screened porch? Archadeck of Columbus delivers an update on this project in Arlington that mimics the feel of an urban oasis complete with an outdoor fireplace and spiral stairway to breathe in the spectacular views. The stunning outdoor fireplace within the screen porch uses mixed medias for a breathtaking design. Not too long ago, we highlighted this project as a “coming soon” story while the screen porch was still under construction. Take a look. We have since completed this stunning multifunctional outdoor structure and we want to share the grand finale with you. 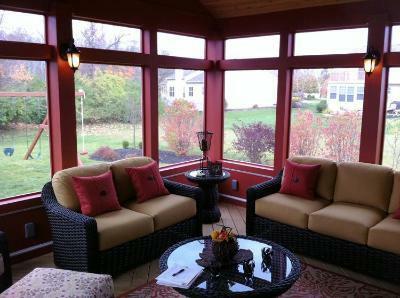 This new screened porch is in Arlington, OH. We removed a deck that was built in 2002 to accommodate the homeowner’s wish for a larger area that includes a screen porch to better suit their lifestyle. The screened porch boasts an abundant 16 x 22 feet of useful space which includes a shed porch as well. The homeowners used their own home’s unique blend of contemporary Frank Lloyd Wright inspired design that includes large soffits with flat rubber roofs to pave the way for the outdoor room’s distinctive flair. The flooring is TimberTech’s XLM Walnut Grove flooring. We also used Screen Eze for the porch screen which is a durable and tough screen and can be used for extremely wide openings. The finished ceiling is done in Paulownia tongue and groove and we also used the same roof columns to make it look 12″ x 12″ . To add to the zen effect that the structure and the house provide, we also added a spiral staircase exiting down to the existing deck that is on the docket for replacement by us for later this year. Since the rear of the house is situated on a ravine, the spiral staircase provides a dramatic effect. Last but certainly not least, we also constructed a beautiful custom outdoor fireplace to the screened porch to finish out this outdoor masterpiece. 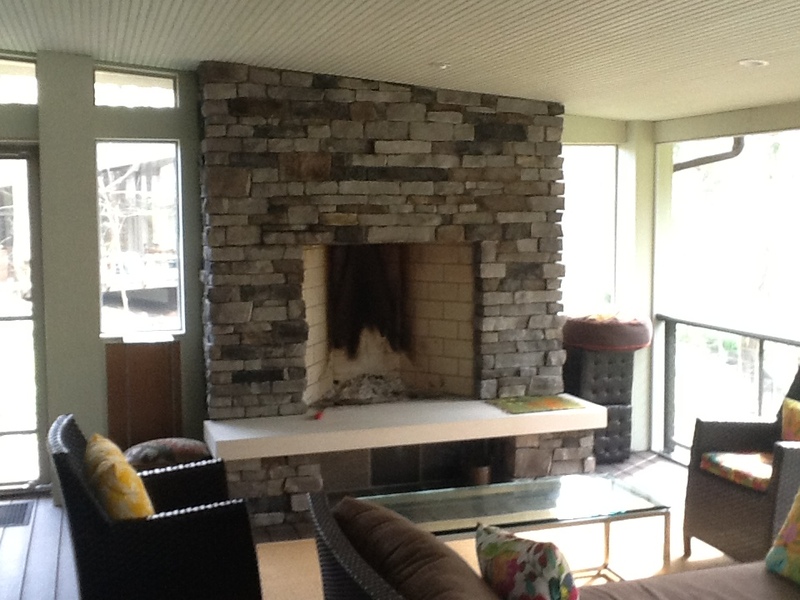 The fireplace is built with split stack style cultured stone on the veneer and topped off with a limestone mantle. The design includes a Rumford style firebox which is 36″ and is a taller firebox which projects more heat. 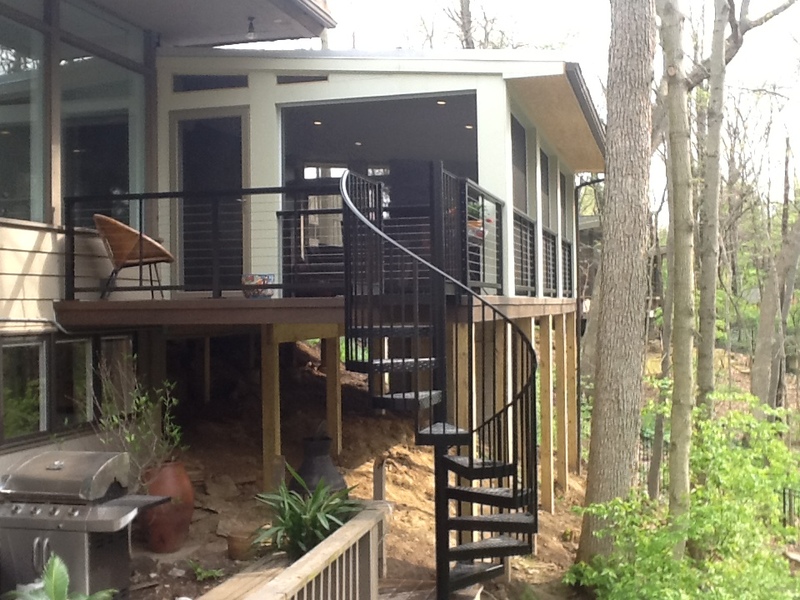 This image shows the grandeur of this screened porch in Arlington from the exterior. The design’s coup de grâce is the exterior wall finished in tile and the Feeney aluminum railing system with Feeney cable rails. The clean lines, paired with the contemporary furnishings the homeowners chose makes this outdoor structure the very definition of zen in outdoor design. 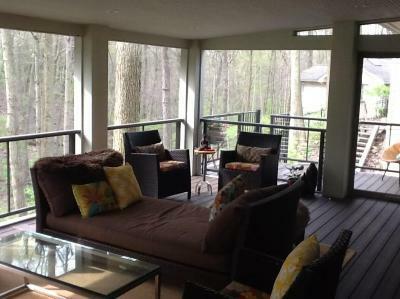 Find out more about our specialized outdoor room designs by contacting Archadeck of Columbus. We can design a screened porch, or outdoor oasis that reflects your personal style, and function in every inch. Call for a free consultation: (740) 879 – 3730 westcolumbus@archadeck.net or visit our website to view more stunning images of screened porches, and outdoor rooms, sure to leave you inspired.